Welcome to Windlass Sword Company, UK! 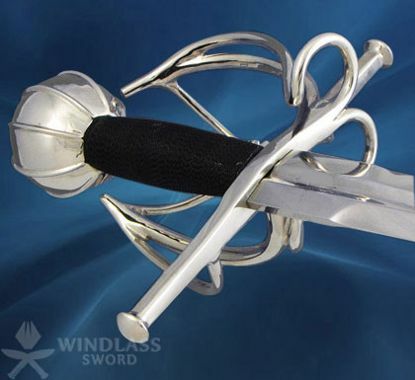 As well as manufacturing military pattern swords, Windlass produces a range of high quality swords for presentation or ceremonial purposes. 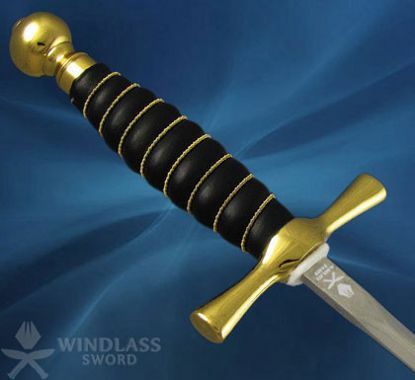 Our extensive range of presentation swords are manufactured with the same care as our military range, all having beautifully etched, hardened and tempered, high carbon steel blades. When mounted on a wooden display plaque or fitted in a presentation case, these swords make ideal awards for sporting, social or commercial achievements. 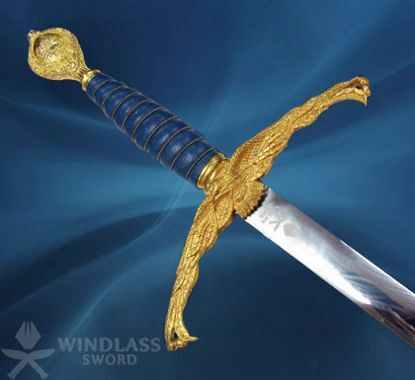 Aviation presentation and other ceremonial occasions can be sanctified by this Royal Air Force Sword which is highly influenced by the much older, large cross hilted swords. This is a version of The Scottish Claymore style sword. The sword begins in an urn-shaped design. It is a two handed sword with an eagle winged cross guard. It has a leather bound grip bound in silver wire. An embossed pommel enhances its construction. 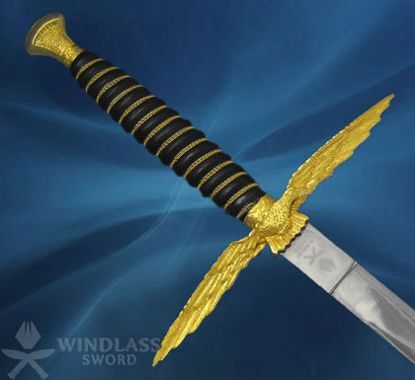 This sword serves as a gift, an award or memorable presentation piece for all Royal Air Force personnel. It has been recognized as a mark of achievement or esteem by the Air Training Corps and the RAF Benevolent Fund. The sword is hand forged and designed. It has a firm leather grip bound by wire around it. This sword is even used on occasions like promotion or retirement of squadrons and RAF stations. Presentation box: 20" x 6/½"
This presentation style sword is influenced by the large cross hilted swords of a much earlier ages; the two handed swords, the Scottish Claymore style, being the chief one. This stylised version of the Claymore and two handed sword features the eagle winged cross guard and a leather grip wrapped in wire. The embossed pommel makes this Fleet Air Arm Claymore Sword an apt sword for commemorating any kind of aviation presentation or anniversary. A valuable gift, an award, a memorable presentation piece for all Fleet Air Arm Personnel; this sword suffices all purposes. It has had the honour of being awarded by the Air Training Corps and the Fleet Air Arm Benevolent Fund as a mark of achievement or esteem. It has a similar appearance to Fleet Air Arm Claymore sword. However it has fewer windings on the hilt. It is a hand forged and finished dagger. 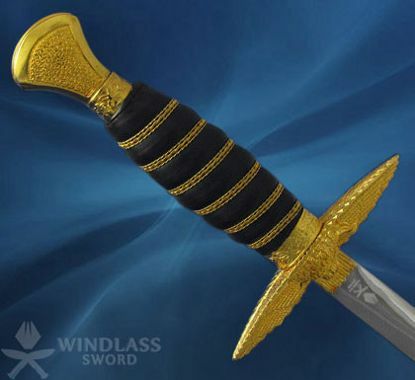 This sword can be used on various other occasions as well, such as promotion of officers or retirement of squadrons and stations. Presentation box: 20" x 6½"
This is a Modern long bladed sword designed in the late 1960's as a presentation and commemorative Sword. The design of the sword is slightly similar to those carried by the Crusading Knights of the 11th and 12th centuries. The grip begins in an urn-shaped metallic design and continues further in hardwood. The cross guard of the sword is brass plated. There are delicate engravings on the blade. This sword had dissolved in it, the pride of a police superintendent. 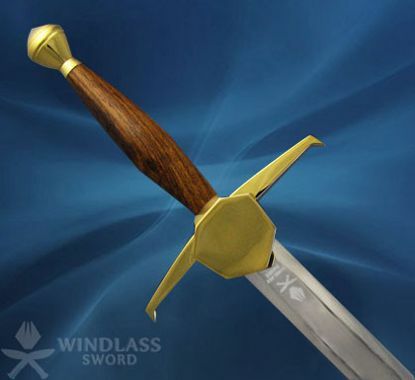 Designed in late 1960, it is a modern long bladed sword. It is used a presentation sword for various occasions. The grip of the sword is made in hardwood. The layout of the sword traces the style of Crusading Knights' sword borne by them during the 11th and 12th centuries. The swords used by masons boast of simplicity. These are basic and simple cross hilted daggers carried by masons and other friendly societies in accordance with rituals that have been prevalent since time immemorial. The sword has a leather grip which is wrapped by wire around it. Colour of the scabbards varies depending upon the position and status of the member. 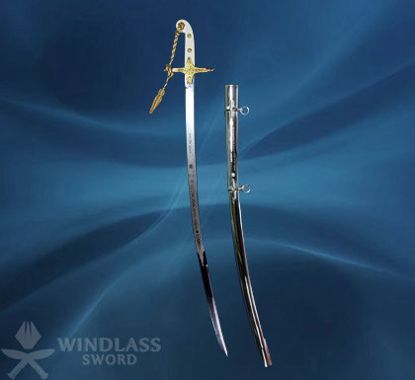 In the commemoration of Her Majesty Queen Elizabeth II Diamond Jubilee, the cross hilted Mameluke Sword which owes its introduction in England to the Duke of Wellington, has been aggrandized by the Windlass Sword. This majestic sword is used by Field Marshals and Generals till date. The blade is etched with "To commemorate Her Majesty Queen Elizabeth II Diamond Jubilee 1952-2012". The words "God Save The Queen” enclosed by two Crowns and the Royal Arms at the base of the blade add to its glory. The flowers of England, Scotland, Wales and Ireland appear on both sides of the blade. The cross piece is gold plated. An optional presentation case is also available. This sword has a great legend associated with it. The Mary Rose sank off Portsmouth in 1545. It remained there for nearly 450 years. When it was raised in 1972, a basket hilted sword was found under the hull. Fortunately it was still intact even after all those years under the seabed. This full scale replica is used by the Mary Rose Trust as a presentation piece for their Flag Officers. Copyright © 2019 Windlass Sword Shop, UK. All Rights Reserved.